Residents of the popular Games Village Estate in Abuja have cried out over the blocking of their estate by Lebanese community in Abuja over development of a disputed land within the estate. Secretary of the Games Village Residents Association, Jude Uze, confirmed the development to newsmen on Thursday. “We don’t have Lebanese community in the estate, who are those that will be attending the church, we don’t know. “This morning they just came in and they brought in a container claiming that development control have given them the authority to start work. “They said they have been given the order that if they were not allowed access into the estate that they should block the access road to estate. 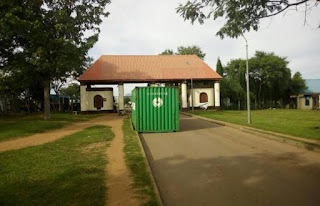 That’s the container you are seeing, blocking the estate. “The fact that we can’t access our estate is a big affront. Can we do this in Lebanon? Can a Nigerian do this in Lebanon? A security officer in the estate, Mohammed Bala said, “we don’t know what is in that container, we are afraid, they could be anything in that container. We have send our people to Police”. Alwan who led in the blockade of the estate explained that they were denied access to the estate and had to resort to blocking the access to the estate.